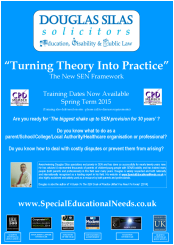 I have recently released Spring term dates for the training days I am currently giving at my offices about the new SEN framework entitled ‘Turning Theory into Practice’ (now commonly referred to as ‘TTIP’). I have provided this training a lot already during the Autumn term to many different types of people/organisations, both parents and professionals, and they have proved very popular (you can read ‘What Delegates Say (TTIP)’ for yourself here). There are five dates (13/28 January, 24 February, and 11/19 March 2015) but, this time, rather than aiming each training day at a different audience as I did in the Autumn, there are three dates aimed at particular groups but three dates where there is no specific audience and training will be provided for everyone (including 19 February 2015, which takes place in Half-term as I know that some people working in education settings said that they were unable to attend last time). You can find out more information/download a flyer here.